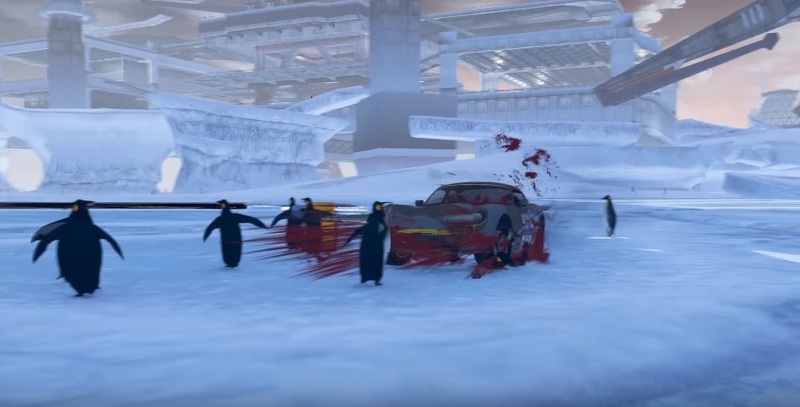 Stainless Games continue to tease us with their “We Do” series of trailers for Carmageddon Max Damage with the very latest focusing on penguins (obviously). Penguins are not the only things that are in danger in Carmageddon Max Damage, expect to run over and maim a fair amount of beach babes, nuns, wheelchair users and cheerleaders as you wreck havoc in a range of open-world environments including city streets and deserts among others. The upcoming car combat title features an impressive tally of 30 heavily customised vehicles to get your pedestrian mowing skills on and includes a career mode along with freeplay mode and multiplayer to boot. Powerups will certainly not be in short supply in Carmageddon Max Damage as Stainless Games have somehow managed to craft 90 of them which should provide ample entertainment. Carmageddon Max Damage will release for the PlayStation 4, Xbox One and PC platforms. Those on the PC that have previously purchased the poorly optimised Carmageddon Reincarnation will receive a copy of Max Damage for free.